LIFETIME POWER TRAIN WARRANTY AND PAYMENTS AS LOW AS $299 A MONTH ON THIS 1 OWNER, PATHFINDER WITH OVER 24 SERVICE RECORDS, See why were one of ALABAMA'S BEST DEALERS 4.7 STAR. Just Fully Serviced with fresh oil and filter change and 100% inspected, so this Pathfinder is ready for work or play. Looking closely at this Immaculate 2013 Nissan Pathfinder, Power Heated Leather Seats, AM/FM/CD/AUX/BLUETOOTH Radio, Steering Wheel Mounted Controls, Cruise Control, Tilt Steering, and Turn Knob 4WD. Under the Hood is the 3.5L V6 with plenty of power, and you can expect good fuel mileage too. Outside the Pathfinder the Paint is Perfect, Fog Lights, Chrome everywhere, and The Right Aluminum Wheels. You will like everything about this Pathfinder SL 4wd. 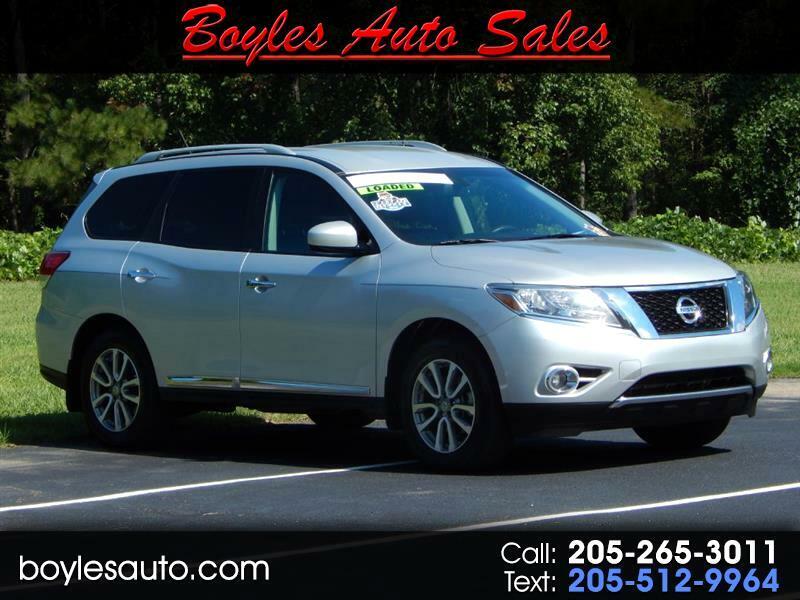 Make the short drive to Boyles Auto and take this Pathfinder for a spin today, You'll Be Impressed! We have All Types of Financing with low rates so you can drive home in your New Pathfinder Today! AND FOR PEACE OF MIND A FREE LIFETIME ENGINE, TRANSMISSION, AND POWER TRAIN WARRANTY AT ZERO COST TO YOU!! Call Scott at 205 265 3011, Randy at 205 269 3196. Visit us online at boylesauto.com to see our complete selection of inventory. BUY ONLINE AT BOYLESAUTO.COM JUST CLICK ON THE APPLY FOR CREDIT TAB, and let's get started. THANK YOU! We'll be talking Soon!